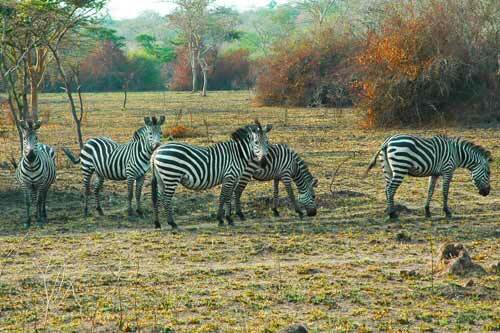 This is a short 1 day Lake Mburo tour to Lake Mburo national park. Lake Mburo is Uganda’s smallest National park but full of wonders. It is located southwest of Kampala and the easiest park to access in Uganda. The park is famous for large numbers of Zebras and Impalas, however, Topis, Elands, Leopard, Hippopotamus, Buffalos, Giraffes, Water bucks and Bushbucks are also habituated in Addition to Warthogs. According to Uganda Wildlife Authority, Lake Mburo National park has over 350 bird species, a good spot for bird watchers and 20% of the park's entrance fee is used to fund local community projects such as building clinics and schools. This short day trip near Kampala is good for those with very limited time in Uganda and want to have a wildlife experience in Uganda. Meet and greet with your guide early in the morning. Start a five hour drive through the suburbs of Kampala/Entebbe. A must stop at the equator with an experimental impression of the change in hemispheres, a good eye opener to African Art, crafts and hand/wood works lined along the equator and also coffee/tea shop are available. On arrival, in lake mburo national park, we go for game drive, searching for the likes of Zebras, Giraffes, Buffalos, Impalas, Waterbucks, and Leopard, to mention but a few. We then go for a boat ride. Water life is charming, great concentration hippopotamus, crocodiles, African fish eagles, pied kingfishers, malachite kingfishers, African fin foot among others. In the Evening we bid farewell to lake Mburo National park and start on our journey back to Kampala. End of our 1 day lake mburo National park tour. Taurus Free Web Directory | itravelnet.com – Travel directory.